June 23, 2011 — On a cloudy, unseasonably cold afternoon for late June, I did the seemingly unthinkable. I sold my Vespa. The sky looked like it might rain if it could muster up the motivation, but at that moment it couldn’t be bothered. I stood in the doorway of my open garage, waiting for my prospective buyer to show up. I was a little early. She was a little late. In the driveway in front of me was my 2008 Vespa Grantourismo 200L, the bike that had saved scootering in my life. Yet here I was about to sell it. I’d been so busy getting the Vespa wiped down and prepped that the significance of the moment was almost lost on me. This is it. I’m really selling this thing. I hate seeing my machines go. They have souls, if little dim ones, and selling them always feels a little bit mean. It’s like giving away a litter of puppies, only somehow I’m both master and mother. This Vespa had to go, though. With my ’74 Honda CB450 almost reassembled, the time was fast approaching when this gorgeous machine would be destined for neglect. It’s too nice a bike and too expensive of a scooter to simply languish in my garage. Someone else needed to enjoy him (I’d named him Paulo the day I brought him home). I also needed to capitalize on the Vespa’s retained value, as that influx of cash would not only get my GL1100 roadworthy, but finance a really exciting CB750 custom project. Looking at Paulo there in the driveway, it hit me that I’d been so busy prepping and preening the scooter that I hadn’t really taken him on any sort of ceremonial last ride. I hadn’t done anything to really say goodbye. My buyer would be there at any moment, but I’d already fired up the Vespa to make sure the idle adjustment was correct. He was just sitting there, puttering away, so I hopped on real quick and buzzed around our apartment complex. No helmet or other gear, just me and the Vespa. As I zoomed in and out of the little ant farm tracks that make up our complex driveways, I couldn’t help but grin like a fool at that brilliant little machine. I often thought of the GT as “Superman’s bicycle” — something that so perfectly captured that feeling of lightness, freedom and exhilaration I felt as a kid on my bicycle, but with more power than my feeble earthling legs could ever dream to muster. Without my helmet on, the wind rushing by made my eyes water, but that was pretty appropriate to how I felt with such a short, improper goodbye to a scooter that had served me so well. I pulled back in front of my garage and had to get right back into scramble mode. I’d thrown in my mod-style flyscreen as a compromise on the price, but I hadn’t installed it yet. Grabbing a 17mm wrench from my tool box, I hurriedly tightened the spread fittings that held the windshield in place. It was the finishing touch for sale and it felt like wrapping a bow around a puppy’s head. It was out of place and out of character for the scooter, since I almost never used the windshield. I did one final adjustment to the idle and shut the bike off, just as Susan, the buyer arrived. We greeted each other and she asked if she could take the Vespa for a test ride. I explained the “you break it you bought it” arrangement in the friendliest terms I could and gave her a quick walk around of the Vespa. I showed her the starting procedure involving the kill switch and the brake. I taught her how to put the bike up on its center stand in case she needed to park it during her test ride. She was nervous. A recent graduate of the MSF rider course, this was to be her first real two-wheeled vehicle. She’d been chauffeured by her best friend, whose name I’ve forgotten, and they’d taken the class together. With our encouragement, Susan fired up the scooter and rode slowly into the gray early evening. Her driver and I talked about motorcycles and scooters in Susan’s absence. She’d yet to really ride her own first bike, though she’d already taken delivery of it. Her boyfriend had purchased her a Harley Sportster 883 — which in fairness is as close to a good beginner bike as HD makes. I chuckled at the thought of the two of them riding around together, Harley and Vespa as unlikely riding companions. We talked about the rider safety course and about the differences between big motorcycles and scooters like the Vespa. Then my iPhone range. It was Susan. The Vespa had puttered out on her at an intersection and she couldn’t remember how to get it started again. I tried to talk her through it on the phone, and thought she’d be okay once she hung up. Then a few moments later, we saw her pushing the Vespa ’round the corner. Turns out she was trying to start it at the ignition key, like a car, rather than pushing the starter button on the right-hand control. It’s easy to get confused on a new machine. It happens to the best of us. I felt a bit sheepish myself, as I’d obviously adjusted the idle a bit too low. Thankfully, it’s a very quick fix. I was worried that such troubles would turn her off to the Vespa — that she might think it was mechanically unsound, even though it wasn’t. But to her credit, she trekked out once more into the gray unknown, this time doing some figure eights to get better acquainted with the Vespa’s slow-speed handling. She was the best kind of unsure, as far as I could tell. She had so many things to take in at once, yet was still having fun. It reminded me of my first motorcycle test ride on a Triumph Bonneville back in 2008. I was so nervous riding the machine that I couldn’t even begin to evaluate its merits. With a much more successful neighborhood excursion under her belt, Susan returned to us and excitedly declared “I got it all the way up to 25!” She had only one nagging concern. She wasn’t sure she was ready to ride the Vespa all the way home herself. Her driver assured her that there were plenty of surface streets and backroads that she could take to get home. She also assured Susan that she’d be driving right behind her in the car, so she could feel free to go as slow as she felt comfortable. I also offered to ride the Vespa home for her if she’d give me a lift back. But to her credit, she went for it. She had some lingering ambivalence about whether or not she’d like the Vespa in the long run, but just as quickly declared that she could always re-sell it if it wasn’t her thing. I tried my best to reassure her that she’d not only enjoy the Vespa, but that in my own experience it has always taken some time to really suss out the character of a machine and whether or not I really liked it. We signed all the paperwork and before I realized the permanence of it all, she’d ridden slowly away with her wingwoman in tow. As the Vespa puttered into the distance under its new owner, the driveway grew quiet once again. The Vespa was gone and I was left with a small stack of money orders and an almost empty garage. The Mrs’ Honda CM400 was tucked well in the back of my one-car garage turned shop. Just six months ago this space was standing room only. My Vespa and my Honda CB650 were stacked up panel to panel with The Mrs’ Buddy 125 and the CM400. So much had changed this season and the now comparatively cavernous garage contained the culprit: the CM400 — the motorcycle that’d evicted the scooters. The Mrs started talking about selling her Buddy 125 scooter the day she’d first ridden the CM400, and it wasn’t even healthy yet. It’d done the same to me. Riding the CM400 home from Bluecat Motors once it was finally healthy and revised had set in motion the sale of my own scooter. I was now sans-scooter for the first time in my riding career. And while I have no doubt that my CB450 will be a wonderful replacement for the kind of riding I used to do on my Vespa, my mind is already scheming about when and how I can have a scooter of some sort in that garage again. It’s only a matter of time. Meanwhile, Godspeed, my little Italian pony. Viaggio felice! Fabulous post. I’m sorry to see your scooter go. Nathaniel, This is a great post. One of your best. 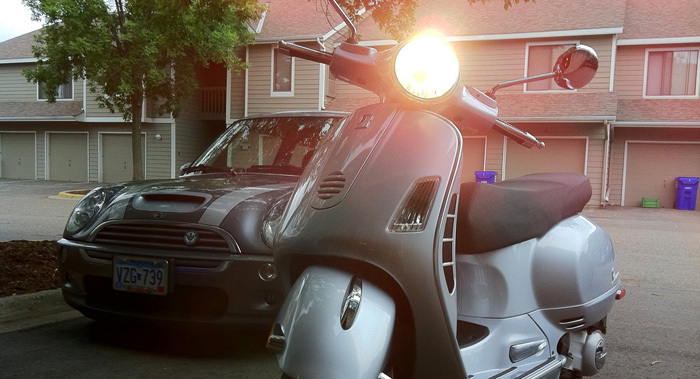 Such a great post in fact that I forgive you for letting go of the Vespa. That, and your promise to get another one some day. Happy Trails, my friend, no matter what you’re riding. Thanks David. I’ll definitely have more scooters in the future. Don’t know if I’ll ever go modern Vespa again, but maybe classic someday.